Three of the smallest Shonen Knives to date join the fray.Hobby progress has been satisfactory recently, mainly on the terrain front. But before I start posting about the development of Kuripu Jima, I wanted to post about these three Shonen Knives that I barely painted in time to use at Knavecon a few weeks ago. Of these three Citadel figures, the dwarf is the most peculiar. The sculpt drifted from through a number of old Citadel ranges over the years, suggesting that even the manufacturers were not sure what the sculpt represented. After checking how various people have painted the miniature in the past, I found very little consistency in how the different areas were treated. Are the horns growing out of the guys head? Or are they part of his helmet? Is he even wearing a helmet? What are the three spiked protrusions on his chest? Are they part of him? Are they some sort of cuirass? The figures visible flesh – the arms mainly – looks atrophied, like that of a zombie model. As that feature was impossible to ignore, I painted the flesh in more unhealthy tones than the rest of the Shonen Knives. As for the rest of the model, I made my choices and fired ahead. I quite like the unusual model now that its finished. What sort of dwarf does it represent? I dont know, its in the eye of the beholder I reckon. I love this model. I used to have a pack of these old dogs years ago, but I sold them on. I regret it a little now and I am keeping an eye out for a few more. I reckon that this particular sculpt is the nicest of the three that were available. 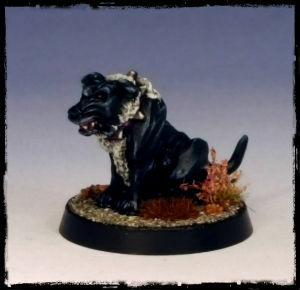 Its is probably my favourite of all the dog miniatures produced by GW over the years. Asslessman did a nice job of converting one of these pooches into a cyber-hound recently too, definitely worth a look. There are a few variants of this model, usually with little horns on its forehead, making it an oni or yokai or something similar. 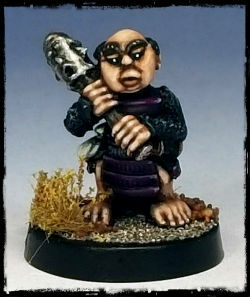 This version was marketed as a Halfling Ashigaru. Like the dog, I would like to pick up the other variants and similar sculpts for this force. It was a fun model to paint. 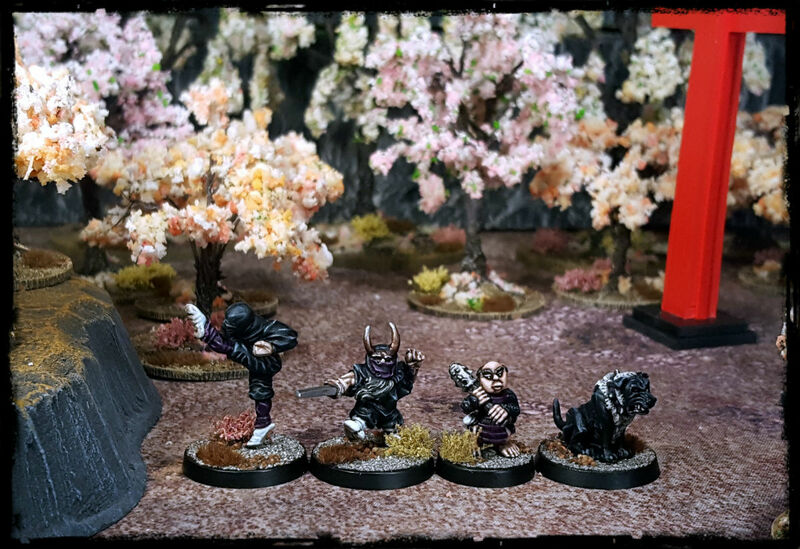 I also painted a high kicking ninja along with these three, but I stupidly forgot to photograph him alone, so his riveting tale will have to follow at a later date. The next post will be about the ever expanding terrain set that I have been preparing for these models. I am quite pleased with how “Kuripu Jima” is turning out. 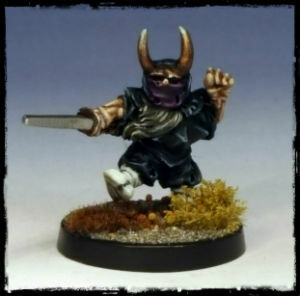 I seem to recall that dwarf being called an undead chaos dwarf ninja. That’s all bases covered, right? He’s a neat sculpt that fits into the Knives with ease. I too like the halfling best – he’s a gorgeous little figure. Undead Chaos Dwarf Ninja was the name of my second album. It wasnt a great model to paint really, but it turned out well enough I think, and there is something appealing about the little guy. Thanks for the feedback Axiom! Excellent – I love those Marauder doggies too and you have done a fine job on that one. Thanks Warburton. As I mentioned above, they are probably my favourite Citadel/Marauder canines of all. I must try to get a pack of them together. Oh, how cool are these guys? Awesome mate, great additions to the Knives! Thanks Alex. I havent got many of them painted in the last month or so (due to terrain making monopolising hobby time) but I plan to get back to the figure painting again now. I love how the title of this post sounds like the start of a bad joke, on the other side, having had teh chance to be here supporting you to finish them is a considerable joy ! I grudgingly have to accept the truth that if you had not been sitting on the couch when I was painting, I may not have finished those four yet. Thats a bad joke alright. Bah. I had one of those in one of the first ever pack of miniatures I bought. Lovely paint job. You did? Thats an interesting model to have in your first blister pack. Do you still have it? Is it the version with the little horns on his head? The ashigaru is the pick of the bunch alright. Thanks for the feedback Riot! I bought hobbits because I was reading the Lord of the rings at the time. Unfortunately it was among the first things to find its way into eBay all those years ago. A set of models more full of character would be hard to find. They all fit into the Knives pretty seamlessly, and add a ton of depth to the force. They will be defening their homeland against your creepy newts in the near future Mr S.
The idea with this project is to link the models together by pseudo-Japanese theme – rather than species – as much as possible. Expect many more non-humans to appear in the project as time goes on.